The Alfa Romeo Giulia's arrival in the UK, no matter how prolonged the build-up, feels like a watershed moment. For now, the steering wheel remains on the wrong side, but very soon that will change and the nation’s compact exec buyers will have the first option of a proper rear-drive Alfa Romeo since the Alfa 75 of the mid-1980s - coincidentally the last car launched by the firm before Fiat assumed control. Its successors were uniformly front-wheel drive, uniformly pretty and uniformly undeserving of the model cull that left the Alfa 159 without a successor in 2011. The Giulia, of course, remedies that with not only an expensively developed longitudinal-engined, rear-drive platform (dubbed, rather exquisitely, Giorgio), but also a raft of new engines including the crucial addition of an all-aluminum 2.2-litre MultiJet II four-cylinder diesel unit. It is available in two formats - 148bhp and 178bhp - and while the lesser model is inevitably cheaper, it is the higher-powered version tested here that suggests itself as a genuine threat to the segment running order. With efficiency at a claimed 67.3mpg and 109g/km; torque at 332lb ft and the national limit dealt with in less than 7.0sec, the Giulia is (for now) technically superior to the equivalent BMW 3 Series, Jaguar XE and Audi A4 across the board. 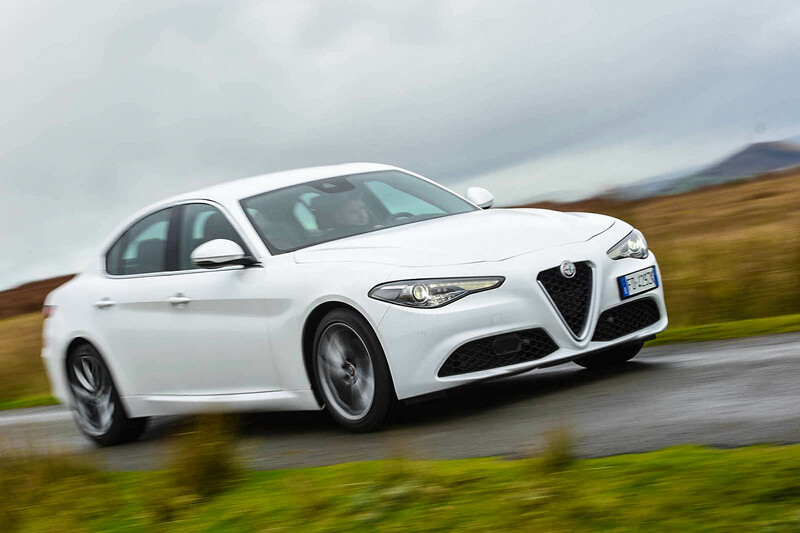 Neither diesel lump can be had in entry-level format (the £29,180 plain Giulia model is offered only with the 197bhp 2.0-litre petrol motor); making the mid-range Super trim the likely sweet spot. The 177bhp variant starts from £31,950 and comes with sat nav, a DAB radio, 17in alloy wheels, rear parking sensors, dual-zone climate control and cruise control as standard. We've previously reported a mixed bag when inspecting the Giulia's interior, and that sentiment continues to ring true. Outwardly, it is rather splendid. Anyone half expecting an Italian sense of style to inform the Alfa's cabin ought to be delighted: the dashboard architecture has clearly been arranged with one eye fixed on what might look beautiful - a useful contrast to the purely functional prettiness its northern European rivals achieve. Were its only requirement to be that you sit and admire it like a Botticelli fresco, then the Giulia would be a triumph. Sadly, it's when the process of driving demands that you engage with your surroundings that the niggles surface like rising damp. Some are merely questionable fit and finish; others, more seriously, are functional - like the seemingly low-rent infotainment screen or the unswitchable stability control or the weirdly unhelpful wiper settings. Subjectively though, these issues tend to provoke mild dismay rather than outright offence. It’s distressingly easy to forgive the squeak of an ill-fitting cupholder cover when the solid metal paddle shifters look so good or ignore the ridiculous aspect ratio of the 8.8in Connect system because the dash swoops so deliciously low above it. 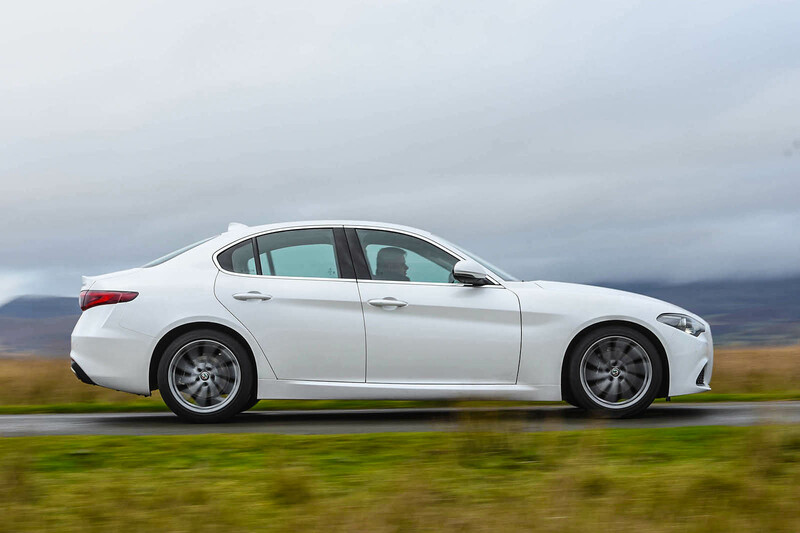 Such leniency is near impossible to uproot in the evaluation of the Giulia’s driving style either – because here too, in broad strokes, it manages to be compellingly good. The crisp, cultured chassis applauded in Europe arrives in the UK mostly intact, even when saddled here with optional 18in wheels and run flat tyres. Shod thusly, its sophisticated ride quality registers a mite too taut on occasion – but it mostly settles into a wonderfully supple groove, one that eschews the cloying, dull-edged comfort of its major rivals. Instead, the Giulia feels magnificently passive and clean-limbed on double wishbones and rear multi-link suspension - and in collaboration with its super-rigid new architecture, proves brilliantly adept at telegraphing contact patch information into the driving experience. To suit the fleet-footed change of direction and apparent lack of mass, Alfa has kept the steering light too – rendering a level of ease that might flirt with over-assistance if its rate of response wasn’t tuned to astutely compliment the bite of its front end. Combine all this with the usual advantages of 50/50 balance, the subtle poise of a pushed chassis rather than a pulled one and the exemplary keenness of a engine and gearbox that seemed to have been synchronised with enthusiasm in mind rather than abject parsimony, and there are great lumps of time in the Giulia’s company where it rewards a driver just as deftly as anything else in the segment. Perhaps more so. Nevertheless, there are bubbles in the gloss here too. Typically, the more time you spend in the Giulia’s company, the more readily they crop up. This is a noisier prospect than most other premium options; in wind content mostly, but also from the running gear occasionally, too. Its rivals are probably better at isolating occupants in general – and certainly in the benign cosseting a driver in the business of long motorway journeys. 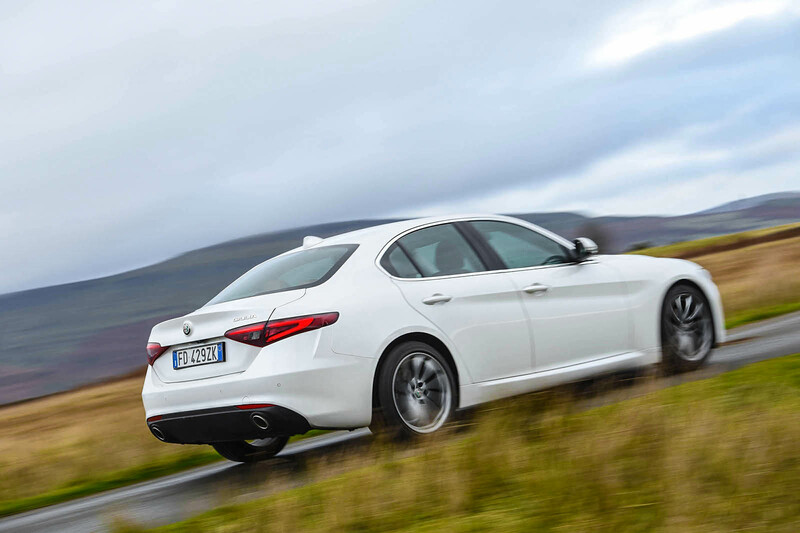 As that is the primary business of the compact exec, it can hardly be overlooked, and reinforces the idea that the Giulia – for all its enormous charm – is not quite the finished article it might have been. That, with any hope, will come as the model matures. But even as it stands, the Giulia is a riveting, idiosyncratic and striking entrant into a class usually defined by an understated brand of superiority. That it is conspicuously flawed too only feels like proof that Turin has finally delivered an Alfa properly worthy of its heritage. German cars' build quality is massively overplayed these days.... they are not what they used to be. I have not had much experience of German cars other than observing rusting Mercedes hulks left over from the 90s. I had a short trip as a passenger in a recent 3 series and as the door clanged shut and I took in the cheap-looking interior plastics I did wonder why people pay over the odds for these things - a Ford or Vauxhall is certainly no worse. It drove nicely, but then again, so does a Ford. I like the Giulia, but the reviewer does seem to make a lot allowances for a car which, in his own words, "is not quite the finished article it might have been", to justify giving it a 4.5 stars rating. Still, it's to good to have more choice in the premium small saloon sector. Hopefully Alfa can iron out most of the niggling issues of the car over its production run. The God-awful front styling is rather more of an issue than the interior fit and finish. Shame. As per true Alfa tradition the exterior styling is beautiful, the drive is good but the let down comes with its function/fit and finish.